©1934, 1961 Erle Stanley Gardner. (P)2016 Brilliance Audio, all rights reserved. These early Earl Stanley Gardner “Perry Mason” novels are extraordinary. There are some legal and cultural anachronisms but if you allow for the early 20th Century writing and setting during Prohibition America, the legal and cultural issues are understandable. Some nomenclature used is offensive by 21st century standards but were common during the period. I will never want this book nor any others modified for current political correctness. Such people who desire to revisions “Huckleberry Finn” or ban “To Kill A Mockingbird” have minds of low caliber that do not wish to remember history. This is a well written mystery and a historical document. 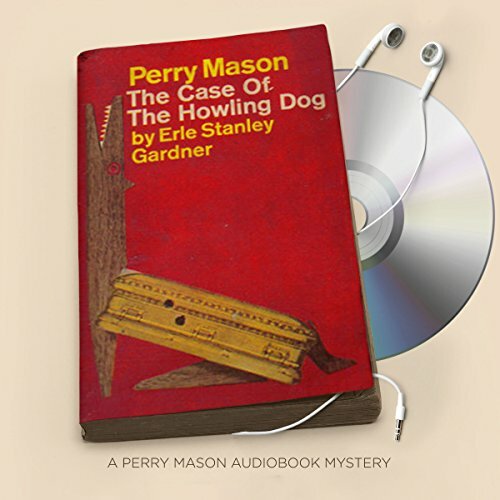 In <strong>The Case of the Howling Dog</strong> by Erle Stanley Gardner, Perry Mason, fresh off a huge court success, gets visited by a man wanting help making a will and stopping his neighbor's dog from howling during the night. The new client, Arthur Cartright, is concerned that a howling dog means death in the neighborhood, and the neighbor's wife, Evelyn Foley, has been seriously ill. Cartright is concerned that Clinton Foley has been making his dog howl in order to scare his wife into dying. With the news that Foley is trying to have Cartright put in a mental institute, Mason tries to send word to Cartright to lie low but never reaches the man. When Mason goes to Foley's house, he finds the man shot to death and the dog dead near his master. Soon, it becomes known that Evelyn Foley is not really the lawful wife of Clinton Foley, who has been living under an assumed name, and his true wife, Bessie Forbes, gets accused of the murder. Mason takes on the case to defend her. He uses all his tricks in the courtroom to get Mrs. Forbes off the case. I enjoyed <strong>The Case of the Howling Dog</strong>, but not as much as the first two books in the series. I found Mason's courtroom techniques intriguing as he points out inconsistencies with the prosecution. The courtroom scenes were dramatic and impressive as Mason strategizes the best way to foil the methods of the prosecution. Another feature of this book that I didn't like is that outside the courtroom (and inside sometimes too) Mason yells easily at others around him, in particular the police responding to the murder, which got disturbing, especially because in the first two books, he didn't resort to yelling in order to get his way. Rather, he used logic and skill. I also did not like the attitudes expressed towards the Chinese in this book. Written in 1934, this book serves ro remind us that African Americans were not the only ones to receive discrimination in this country. In fact, in 1882, Grover Cleveland signed the Chinese Exclusion Act that made it illegal for Chinese to move to this country. In addition, even Chinese born in the United States could not become citizens. The law was not lifted until the middle of World War II, in 1943, but only 105 were allowed each year into the country then. So the negative attitudes towards Chinese shown in this book, including racial slurs, reflect the prevailing attitudes of the day. The Chinese Exclusion Act is seen when immigration officers come and drag away the Chinese cook because he sneaked into the country from Mexico, not having been allowed to immigrate legally. The way the officers talk to the man is truly offensive based upon today's standards, so it is crucial to read this book with the era in mind. One other detail I didn't appreciate as much was the way Mason makes it clear that he is out to win, no matter what methods he uses. To do so, he uses tricks to discredit actual facts that don't help his case. He explains his philosophy that his job isn't really to find the truth but instead to win. Alexander Cendese performs the audio version of <strong>The Case of the Howling Dog</strong>. He sounds ideally as I might imagine Perry Mason might sound and uses his powerful voice effectively. The courtroom scenes come across strongly, with effective direct and redirect scenes. Cendese's use of voices for the other characters comes across effectively too. I found his performance to work well and really appreciated it. In all, I appreciated <strong>The Case of the Howling Dog</strong>. The story was interesting, and the courtroom scenes were full of drama. However, I did not find this book as effective as the first two books in the series. I didn't like the yelling, and I didn't like Mason's tricks that squashed the prosecution's actual facts. I give this book for four stars.